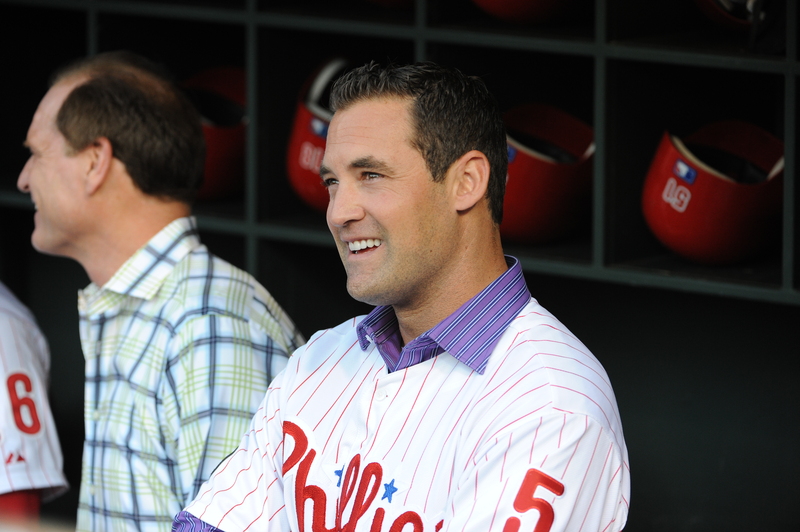 Pat Burrell was a slugger. All sluggers blast home runs, drive in runs, strike out and go in slumps. Pat was no different. But, the fans never really got on him. Del Ennis was booed badly in the 1950s, Mike Schmidt in the 1970s and now Ryan Howard is hearing it. As was announced yesterday, Pat is going into the Wall of Fame on July 31. Some people don’t think he belongs. Others do. It seems to be that way ever year. Charlie Manuel, as the 2014 inductee, gets to induct Pat come July. That’s neat. We’ll figure out a way to surprise Pat as far as unveiling his plaque. Pat will also be the guest of honor at the Alumni Luncheon for Seniors, Thursday noon, July 30. Ticket information will be announced later. He’ll also be on hand for Alumni Night on August 1 and Sunday, the final day of Alumni weekend. Bob Warrington, a Philadelphia native who is a baseball history buff, has authored an interesting story about the Phillies’ spring training in 1915. Check it out at http://www.phillies.com/alumni. That 1915 team went on to win the first pennant in Phillies history. More stories about that team and that season will be posted on http://www.phillies.com/alumni the next eight months. We certainly know of the Whiz Kids, the 1980 World Champions, 1983 and 1993 pennant winners and have lived through the golden era of 2007-2011. But, we don’t know much about the National League pennant winners of 100 years ago.. That’s the purpose of these online stories coming up. An exhibition game involving the Phillies and the University of Tampa at Bright House Field is scheduled for Sunday, 1:05 p.m. It is a big event for UT. The president and notable Alumni will throw out the first ball, the band, cheerleaders, dance team and mascot will all be there. Gates open at 10:35 a.m., the same for all Clearwater games. Also on tap Sunday, Baseball Chapel will take place early in the morning. BC holds services at every major league and minor league team throughout the season. Phillies broadcasters will have their annual production meeting with Ruben and Ryne after the game. It’s a chance for the broadcasters to catch up on the camp and players. Tom McCarthy, Matt Stairs, Ben Davis and Greg Murphy will be on TV for the first time Tuesday afternoon (Yankees at Clearwater). Scott Franzke and Larry Andersen will have their first radio broadcast that day. It took four years to build Veterans Stadium and 62 seconds to implode it. **March 7, Dallas Green, The Mouth That Roared; 11:45 a.m. to 12.45 p.m.
**March 13, I’ll be signing my book, If These Walls Could Talk; 11:45 a.m. to 12:45 p.m.
**March 21, Dallas Green, The Mouth That Roared; 11:30 a.m. to 12:15 p.m. Bright House Field, Main Concourse, third base side. What Is A Half Field? What you see is a half field, which probably raises a question, “What’s a half field?” Glad you asked. Well, there’s no outfield which is why it is called a half field….I guess. It is a place where infielders can work on defense (fielding grounders, throwing, turning double plays), pitchers can do their PFP drills (pitchers fielding practice, pick offs) and catchers can work on refining their skills in blocking balls in the dirt, always a fun drill. It also a place that children of players will use sometimes while waiting for dad after games. Where is this place? Glad you asked. It is located on the west side of Bright House Field, opposite the entrance to the Phillies offices and clubhouse. Day 3 is pretty much like the first two days. This pattern will continue the next two days. Sunday, the Phillies play the University of Tampa at 1:05 p.m. at Bright House. Major League Baseball schedules photo days in each camp. For the Phillies that day is tomorrow. Wire services, licensees and networks will set up stations in the Bright House Field in-door batting cages as well as locations outside. Players will parade through starting as early as 6:30 a.m. Ever try smiling for a photographer at that hour? Players and their wives will began posing for a new Phillies Cookbook tomorrow and continue on Saturday. Community Outreach is in charge of the product which will go on sale at Citizens Bank Park during the season. The annual Clearwater Chamber of Commerce reception will be held at 5 p.m. tomorrow in the party suites at Bright House Field. Club executives and a handful of players will attend. Saturday morning features Major League Baseball oral cancer screening for all players. That night, Chase Utley will be honored at the annual Clearwater For Youth banquet. Aaron Rowand arrives in camp on Sunday and will be a guest instructor until March 8. Monday morning begins with domestic violence training for players, coaches and staff, something that MLB is scheduling for each camp. Workout that day will be shortened for the annual team golf outing in the afternoon. A new video board and side LED “ribbon” display will be ready for Sunday’s game with the U. of Tampa. The board is larger, brighter and will offer more video features. Check out the video on this site for complete details including the debut of some Citizens Bank Park food favorites in spring training. Two of Bull’s BBQ’s sandwiches are among the new items. Greg Luzinski hit the most upper deck home runs in Veterans Stadium history, eight. His first big league home run landed in the upper deck in left field. He also is the only player to hit a home run off the Philadelphia Phil and Phyllis/Liberty Bell home run display in dead center field. **March 13, I’ll be signing my book, If These Walls Could Talk; 11:45 a.m. to 121>45 p.m.
During photo day tomorrow how many times will photographers say “cheese”? Which raises the question, what do photographers say when they are taking pictures of cheese? Day 2 today follows Day 1 (yep, really). 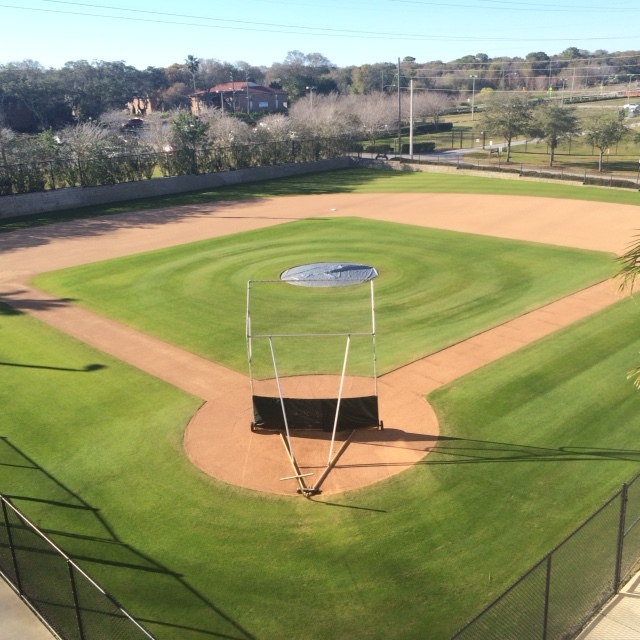 All four fields at Carpenter Complex will be used again. Sign is mounted on a fence as the players leave their Bright House Field Clubhouse for workouts at Carpenter. 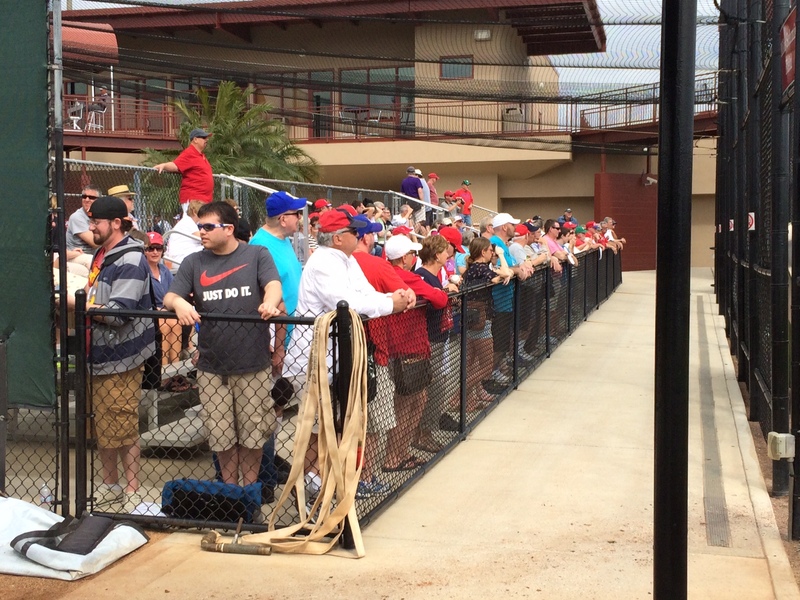 Fans lined the bleachers at Carpenter Complex to watch first day of workouts on Schmidt Field. Elderly to youth. 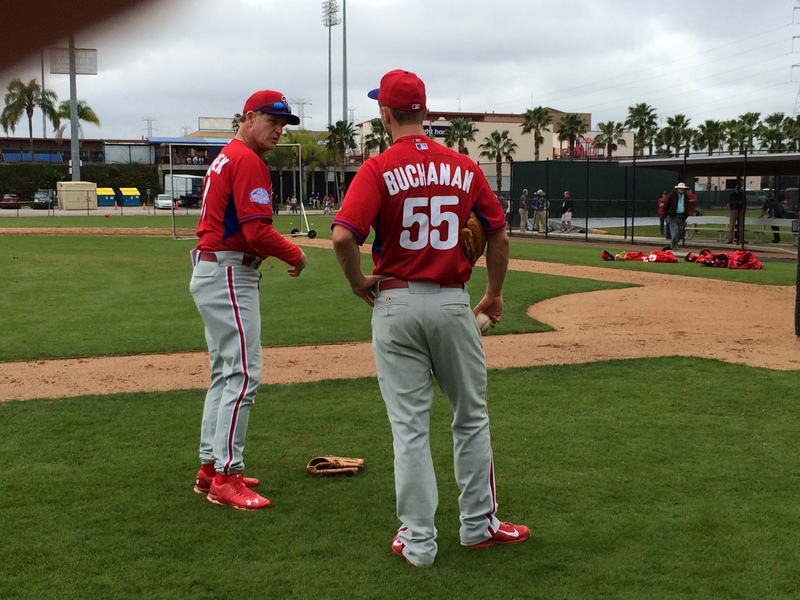 Yep, Larry Andersen (left) is passing on some pitching knowledge to David Buchanan. Drying time for jerseys following Day 1. Today, video tapings will take place pre- and post-workout in the multi-media room. Video will be used on Phillies telecasts and PhanaVision . . . “What’s New at Bright House Field” will be revealed for the media in the left field concourse at 1:30. Tomorrow, is signing day in the multi-media room. 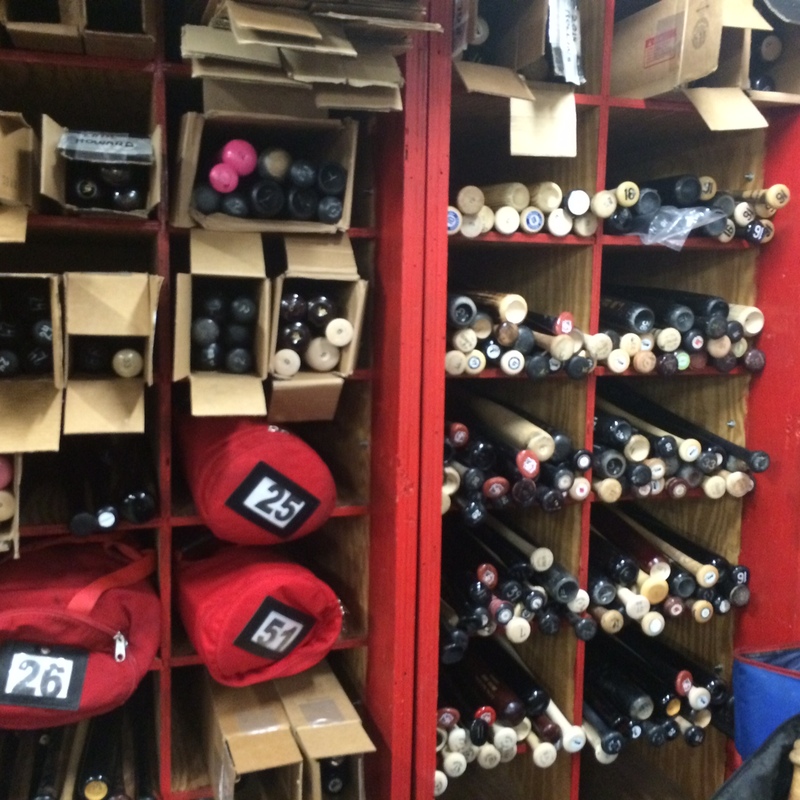 Over 8,000 items (balls, caps, bats) will be signed by the players for the team’s Community Outreach department. That begins at 8 and continues after the workout . . . Players will also undergo eye exams starting at 8 . . . And, players are also measured for new uniforms by Majestic. Each player gets two home and two road uniforms. Dan Plesac recorded the last out in the history of Veterans Stadium, fanning Atlanta CF Ryan Langerhans in the top of the ninth inning, September 28, 2003. He’s also on record as allowing the fifth and final hit in the career of Larry Andersen, an eighth-inning single to right field, April 18, 1993, at Wrigley Field. Plesac is in camp as a guest instructor through Friday. So is LA. Perhaps we can recreate LA’s historic at-bat off Plesac. This time it would be in slow motion. Introductions and speeches are out of the so it’s to the fields for everyone in Day 1 of spring training. Officially. A week from today and the games begin. Six weeks from today and it’s baseball for real. Catchers have their work cut out for them. Daily they are needed to warm up pitchers. Then, there’s catching batting practice. Eventually, Grapefruit League games. Plus dragging around a large equipment bag filled with their gear. If you can catch and throw, your chances at a lengthy big league career are enhanced. But, you have to be willing to work. Wednesday : 1B-OF Danny Cater (75) . . . Thursday: RHP Scott Service (48) . . . Friday: RHP Cliff Politte (48), OF Matt Stairs (47), C-!B John Wockenfuss (66) . . . Sunday: LHP Omar Daal (43) . . . Tuesday: OF Ron Gant (50), SS Chico Fernandez (83). February 25, 1972: Phillies GM John Quinn pulled off his last trade, sending Rick Wise to the Cardinals for Steve Carlton. MLB has made some changes to speed up the pace of game. The pace helps dictate the length of games. Here’s a drastic idea: remove time of game from box scores. Baseball isn’t played by a clock so why should it be clocked. Length of games isn’t an issue in the NBA, NFL, NHL or Senior Citizens bingo. “Bob Conley, Don Cardwell, Chris Short and I were invited to a mini-camp before the big league camp opened in Clearwater. Short and I rode the train from Wilmington, Delaware. We stayed at the West Coast Hotel, three to a room. We weren’t allowed to have cars so we walked everywhere. We were kept around to throw BP TO Hamner, Jones, Ennis, Ashburn and those guys. We were young, wild, could throw hard and we were trying to impress everyone. The vets hated us, didn’t want to face us. Over the course of the last year, Phillies Insider has had one view each from Norway, Libya, Cambodia, Tajikista, Guadeloupe, Senegal, Slovenia, Colombia, Madagascar, Argentina, Ukraine, Hong Kong, Virgin Islands, Pakistan, Algeria, Guam, Jamaica, Montenegro, Morocco, Estonia. A dozen infielders and outfielders have their physicals today and then tomorrow spring drills begin for 58 players wearing Phillies uniforms. Six weeks from tomorrow, the season opens: Red Sox vs. Phillies at Citizens Bank Park. Opening day roster limit is 25. 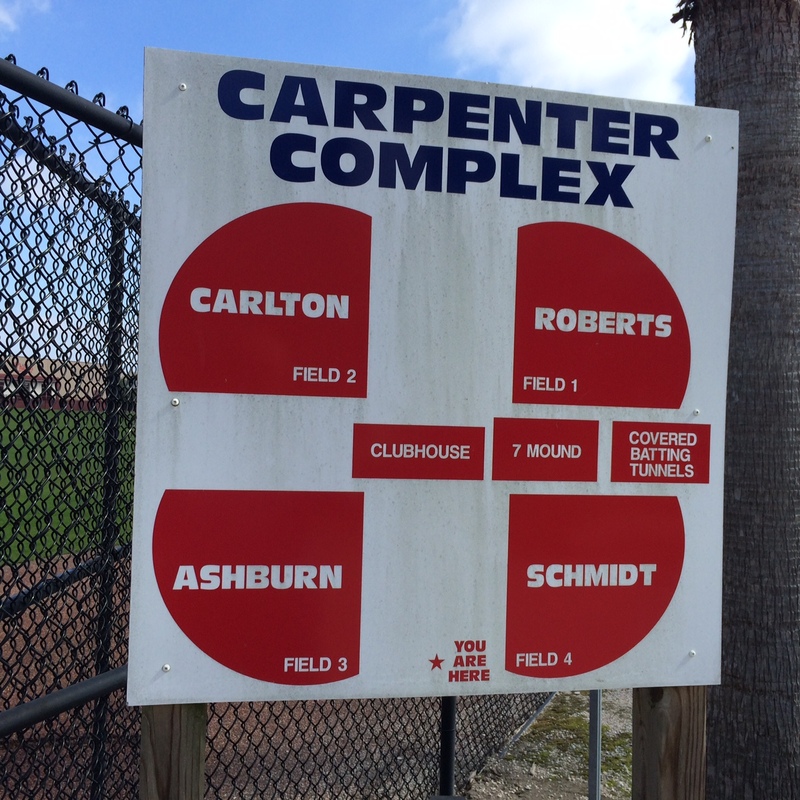 Four fields (Ashburn, Roberts, Carlton and Schmidt) at Carpenter Complex plus Bright House Field will be in use. 8:00 a.m., Ryne oversees a meeting of his staff and all the instructors to review the schedule. This happens every morning. 8:30 a.m., players are due to report but they’ll be there plenty early. 9:15 a.m., team meeting with introduction of non-uniform personnel, general rules and policies. 10:15 a.m., bunt defense on Schmidt field for everyone. 11 a.m., pitchers long toss on Schmidt, position players on Ashburn. 11:20 a.m., team fundamentals, two groups, Schmidt and Ashburn fields again. 11:25 a.m., groups 1 and 2 pitchers begin warming for live batting practice. 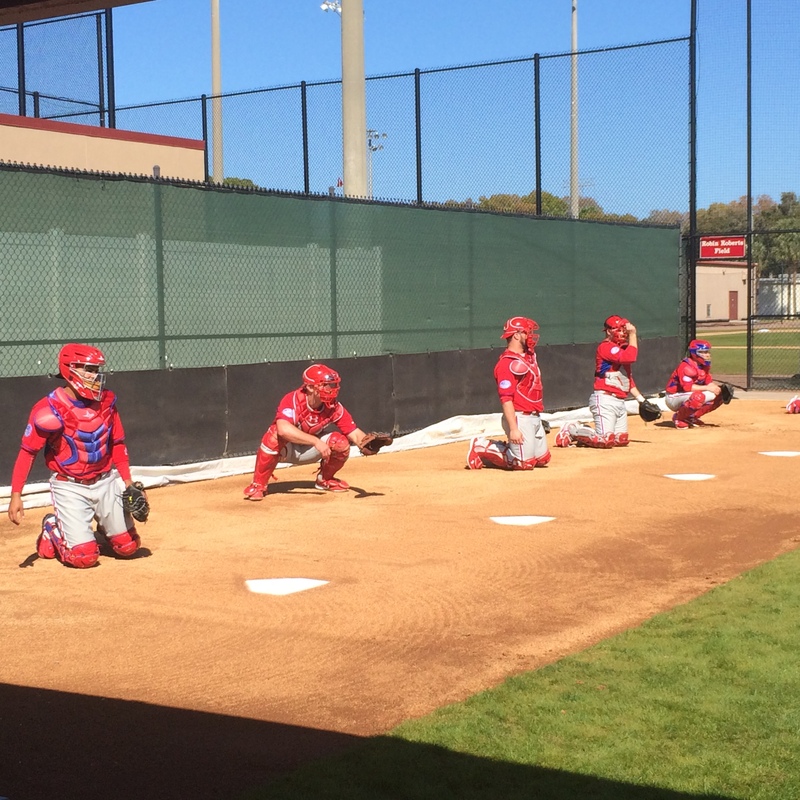 Six catchers in camp get to warm up the pitchers, a chore they face daily. 11:45 a.m., live batting practice for four groups of hitters; Ashburn, Schmidt, Carlton and Roberts fields. 12:10 p.m., pitchers conditioning at Bright House Field. 12:20 p.m., staff batting practice on all four fields. Staff meaning coaches and instructors in camp. Guest instructors are not required to throw BP! 12:50 p.m., defensive work. Infielders on Ashburn, outfielders on Roberts and catchers on Carlton. 1:25 p.m., conditioning for position players on Ashburn field. Additional one-on-one sessions with certain players can continue following conditioning. Fans are welcome to attend the workouts. Parking is free and there’s no admission charge. Bleachers are available at Carpenter Complex and fans can wonder around to catch what’s going on each field. Food and souvenirs are available at Carpenter Complex. The Diamond Outfitters store at Bright House Field is also open. You’ll read about Chase Utley’s media session later on phillies.com. He’s meeting with the media after today’s workout. Players are drifting into the multi-purpose room near the clubhouse these days to tape video features for Phanavision during the season. Phillie Phanatic has a photo shoot today. Not sure the subject but I’m often unsure of Phanatic’s doings. Life must have been boring before the Phanatic came into being in 1978. The year is 2004 and the two Paul Owens Award winners are in the big league camp. 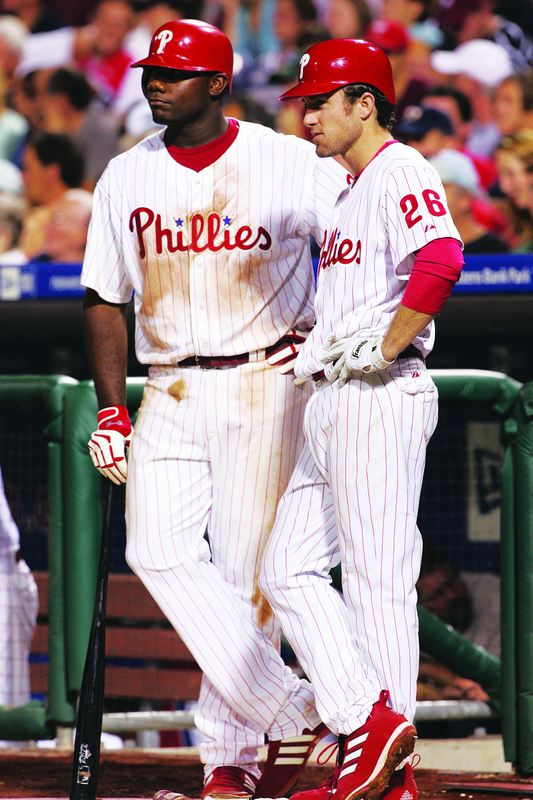 You might not recognize them because of their uniform numbers: Cole Hamels (79) and Ryan Howard (65). Darren Daulton stopped by Bright House Field on Sunday and spent time chatting with Mike Schmidt. If you haven’t read it, Todd Zolecki’s story on Daulton being cancer free is a must. Seven home plates and seven mounds (covered by a tarp) await pitchers and catchers as spring training starts this morning. 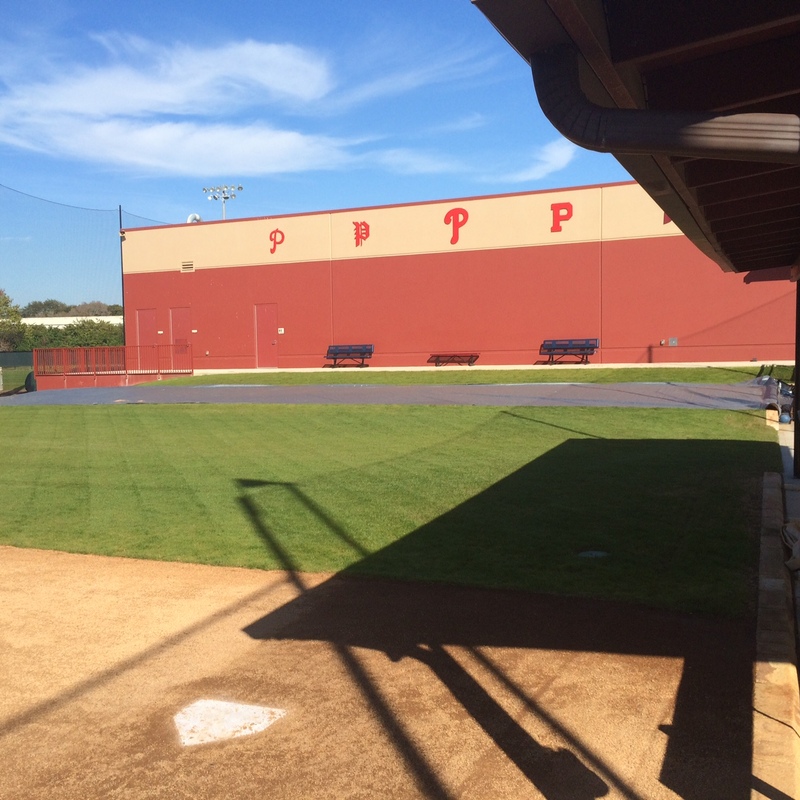 These mounds are located between the clubhouse and large indoor batting cages at Carpenter Complex. They’ll be used heavily until April. A total of 28 pitchers, which includes five non-roster arms and six catchers, of which three are also non-roster, will work out today. 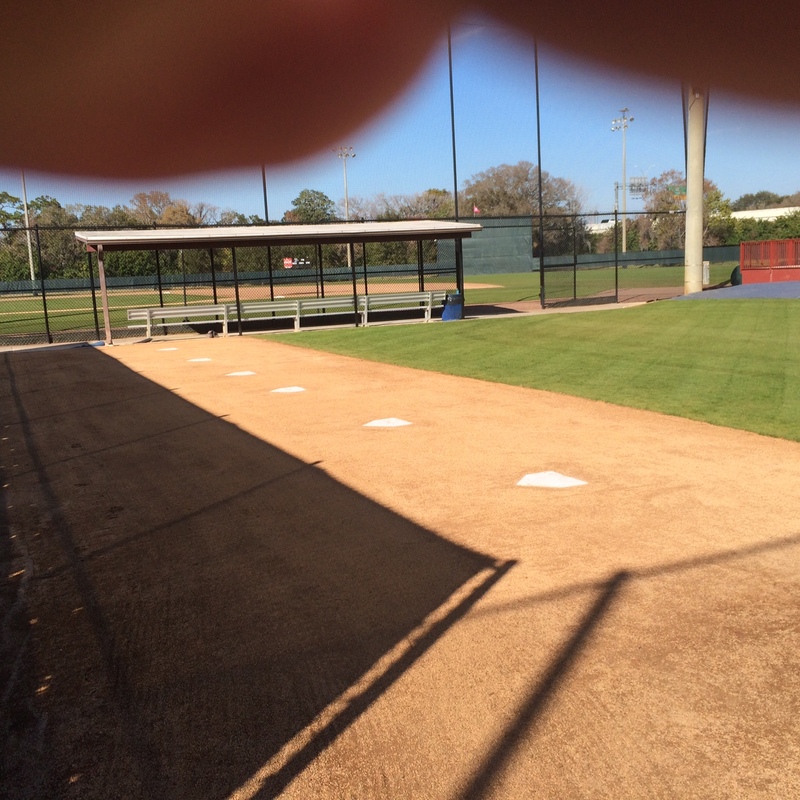 Not all pitchers will throw off these mounds as pitchers will be divided into groups. Ryne will speak to the group before they take the field around 10 a.m. His main address will be next Tuesday, the first day of workout for the entire team. In addition to Ryne’s major league staff, 12 instructors from the minor league camp will be working during the big league camp. Guest instructors in uniform today include Larry Andersen, Dave Hollins, Mike Schmidt and Charlie Manuel. Other guest instructors will spend time in Clearwater later. Hollins will be in uniform through March 1, LA, March 3, Schmidt, March 17 while Manuel will be here the entire camp. Jon Papelbon will meet with writers and broadcasters in the Media Room after tomorrow’s workout; Cole, following Saturday’s practice and Chase Utley, Monday. Fans can follow the club right here on phillies.com. Beat writer Todd Zolecki will file daily reports, video interviews will be provided by Scott Palmer, photographer Miles Kennedy will provide images for multiple uses and several employees will feed social media. This blog will be posted from time to time. 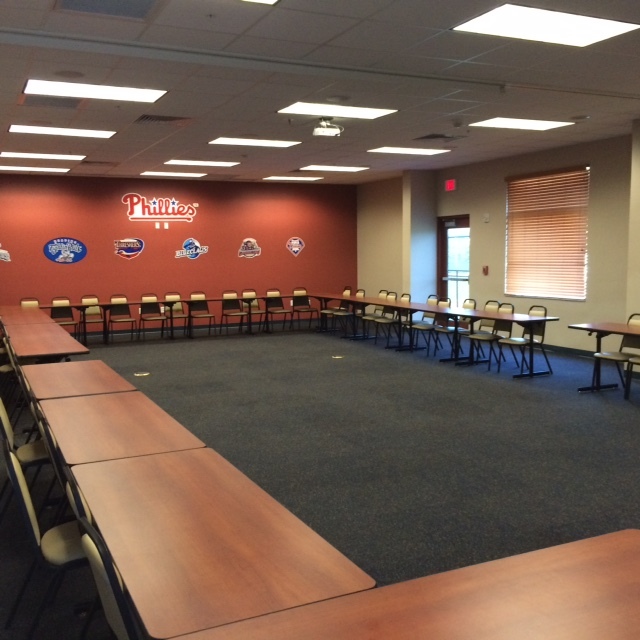 A large meeting room on the second floor of the Paul Owens Training Facility at Carpenter Complex was empty yesterday. Today it isn’t. Ruben and Ryne plus all the coaches and instructors, athletic trainers, baseball administration officials and president Pat Gillick have filled the room. They’re reviewing every player that is in camp, 40-man roster and the non-roster players. That’ll continue into tomorrow before the annual Bill Giles golf tourney in the afternoon. Pitchers and catchers are due in camp tomorrow. They’ll undergo physical examinations and then hit the Carpenter Complex four fields Thursday. Daily works begin at 10 a.m. and are open to the public free of charge. Infielders and outfielders get their exams on Monday and begin drills on Tuesday. Ryne Sandberg will hold a session with the media tomorrow; Cliff Lee, Thursday. ICYMI: Minor league contracts signed over the weekend: RHP Joe Blanton (Royals), RHP B.J. Rosenberg (Dodgers) and C Lou Marson (Reds). Phillies scouts have now begun looking over amateur players. This past weekend, four college teams played doubleheaders at Bright House Field, USF, Cal State Fullerton, Alabama St. and Louisville. In the first-year player draft this June, the Phillies will have the 10th selection in the first round. Wednesday: RHP Tyler Green (45), LHP Kyle Abbott (47), RHP Rocky Childress (53) . . .
Thursday: RHP Dave Stewart (58) . . . Saturday: OF Ted Savage (78) . . . Sunday: OF Joe Lefebvre (59), OF Mike Rogodzinski (67) . . . Monday: RHP Jason Boyd (42), OF John Morris (54). Larry Bowa played in the last game at Connie Mack Stadium, got the first hit in the first game at Veterans Stadium, managed the Phillies in the last game at the Vet and the first game at Citizens Bank Park. Last ejection at the Vet and Jack Russell Memorial Stadium? Bowa. 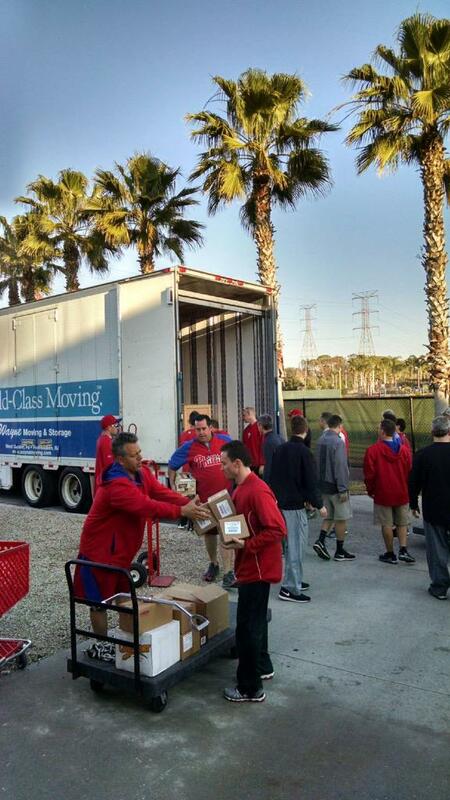 The equipment truck that left Citizens Bank Park on Friday morning for Bright House Field arrived Sunday morning in bright, sunny Clearwater. Led by Frank Coppenbarger (Director, Team Travel & Clubhouse Services), Phil Sheridan (Manager, Home Clubhouse), Danny O’Rourke (Manager, Equipment & Umpire Services), Kevin Steinhour (Manager, Visiting Clubhouse) and 25 other pair of hands, the job of unloading the truck began at 8. 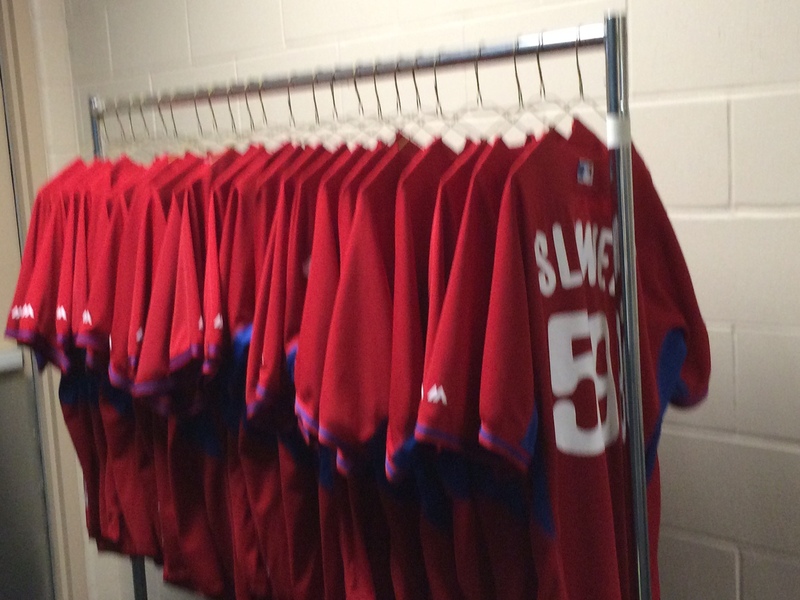 Within an hour, everything was off the truck and in the Phillies clubhouse or equipment storage room. According to Frank, that was a record time. “Of course, we had 30 people working,” he mused. By 1 p.m., the empty lockers were filled with uniforms, shoes, gloves, undergarments, jackets, caps, socks. Name plates are in position above each locker. 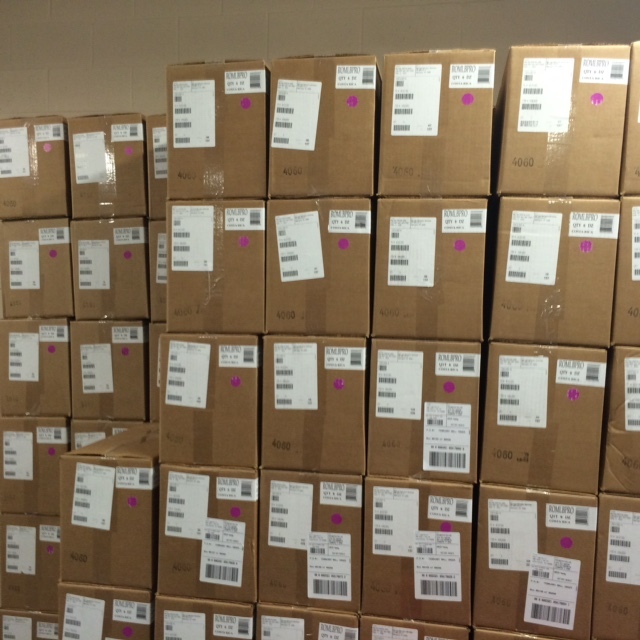 2,400 baseballs. Soon they come out a dozen at a time. What do baseballs face? being beat up by bats, grass stains, dirt stains, endless rubbing by pitchers, landing in the hands of lucky fans in the seats and bad calls by umpires. Beyond right field is a pond, where creatures called alligators have been known to live. Do alligators get indigestion from dining on baseballs? If Howard really gets a hold of one and wind is blowing toward right, a ball could land on Route 19, setting off who knows what. Some baseballs will be autographed by players and become a keepsake. It’s all part of the life of a baseball. The 1,200 bats are stored here. Regulars have a larger stock than the non-regulars.Some bats will produce hits and runs. Some, outs. Some will completely miss hitting a ball. And, some will break. Need a cap? What size? 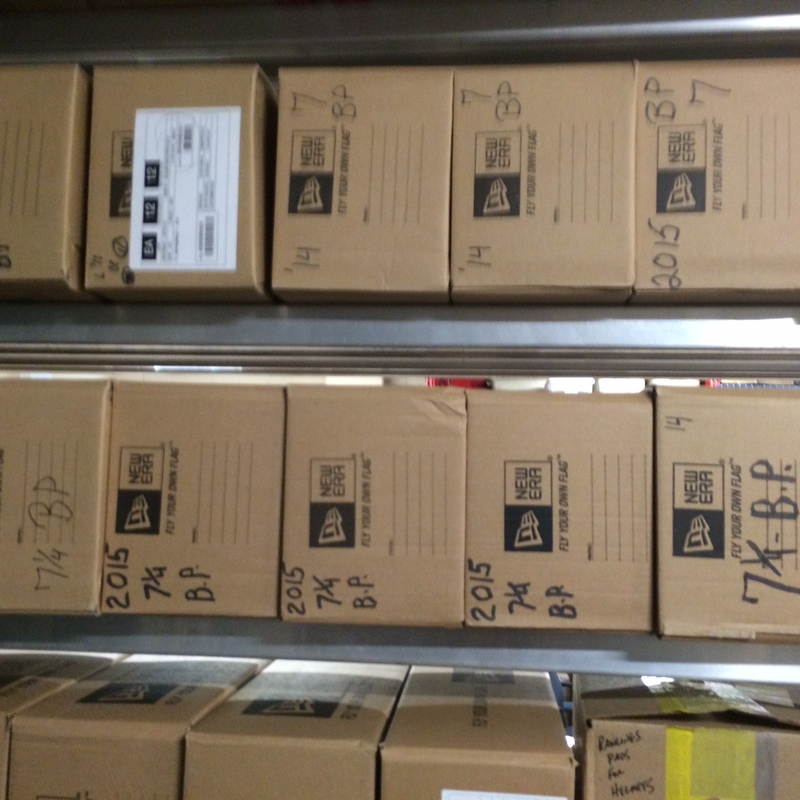 You’ll notice “BP” on boxes. They are the ones the players will wear for workouts and spring games. Caps can get dirty and sweaty. Pitchers often will adjust them while on the mound, off and on, off and on. Don’t caps fit right? Are pitchers a creature of routines? Afraid to throw the ball? Adjusting the cap to calm their anger after the umpire missed a pitch? All of the above? According the calendar, winter is still. Baseball is about to begin, a comforting sign that spring is coming. For 1,187 games, Jimmy Rollins was at shortstop for the Phillies and Chase Utley was stationed on the other side of second base. No other SS-2B combo ever played that many games together. Two kids from California became household names in Philadelphia. They were part of the core that brought five straight Division titles, two pennants, back-to-back World Series appearances and one World Championship. It goes down as the greatest run in Phillies history. Dismantling of the core began with the trade of Rollins to the Dodgers. Rollins was the longest-tenured player in baseball, 14-plus seasons in pinstripes. With his departure, Utley assumes that position, parts of 12 seasons. The torch for most games with another teammate has been passed on to Ryan Howard and Chase. They’ve started 1,078 games on the right side of the diamond. No one else can currently match that. Howard, Utley and Rollins started 910 regular season games together, the most in baseball history. The previous record (886 G) was held by the Dodgers’ Steve Garvey (1B), Davey Lopes (2B) and Bill Russell (SS). Position players work out first time in Clearwater on February 24. It is well documented, the Phillies continue to look to move more veterans as they rebuild, retool, restructure….whatever you want to call it. Perhaps Chase and Ryan will no longer be side-by-side when the season starts. Perhaps they will be. Stan Musial was a Cardinal, Ernie Banks a Cub, Mickey Mantle and Joe DiMaggio, Yankees. More recently, Derek Jeter and Mariano Rivera played their entire careers with the Yankees. With free agency, the odds of players staying with one team their entire careers is diminishing. In the history of the Phillies there are four players with double-digit years of not wearing any other uniform: 3B Mike Schmidt, 18; RHP Larry Christenson, 11; INF Terry Harmon and RHP Bob Miller, 10 each. Jimmy, Chase and Ryan were in the mix. Now only Chase and Ryan have a chance. Lockers in the south end of the Phillies clubhouse at Bright House Field are empty right now. 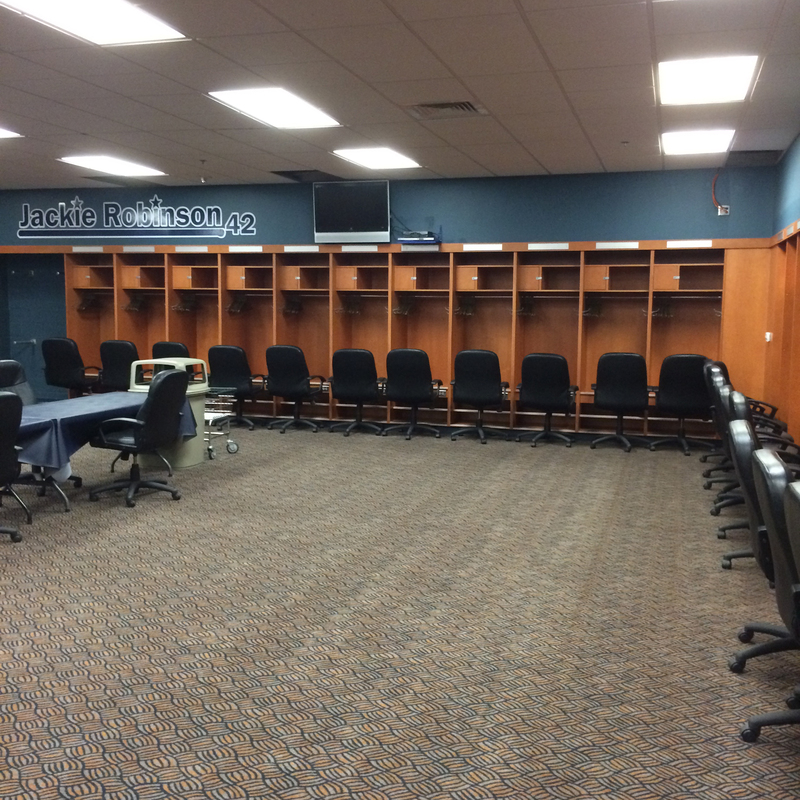 This is the area in which rookies and most non-roster players will dress. Sunday morning the equipment truck arrives at Bright House Field. The process of unloading the truck begins early that day. The empty lockers will no longer be empty. 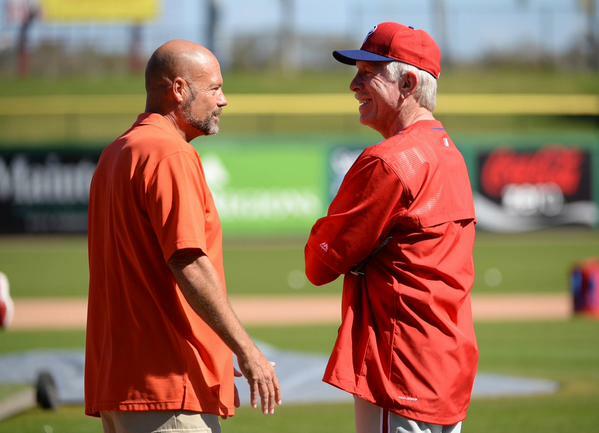 President Pat Gillick checked in on Saturday and Dallas Green arrives in Clearwater tonight. Pitchers and catchers will undergo physicals on Wednesday, February 17 and work out the next day at Carpenter Complex. Full squad’s first workout is February 24. Approximately a dozen players that will be in the big league camp are working out on their own. Cody Asche is one and he’s working in the outfield with instructors Rob Ducey and Andy Abad. Idea is to see if he has the flexibility to play another position. It won’t be long until you hear the radio-TV voices of the Phillies once again. The first spring training game is March 3, the Yankees at Bright House Field. It will be televised by Comcast Sportsnet and aired on CBS Radio in Philly. CSN will televise six games with The Comcast Network carrying 12 more. MLB.com will carry seven and CBS radio will broadcast 14 games. Two road games will be on ESPN TV. Paul Hagen’s penned another “Where Are They Now” posted on http://www.phillies.com/alumni. Featured this time is Chris Coste, a fan favorite. Be sure to check it out. Today: INF Kevin Sefcik (44), OF Lenny Dykstra (52), LHP Larry McWilliams (61) . . .
Wednesday: OF Ollie Brown (71) . . . Thursday: OF Ruben Amaro Jr. (50), RHP Dennis Springer (50) . . . Friday: SS Kevin Stocker (45), LHP Mike Mimbs (46) . . . Saturday: INF Larry Milbourne (64), RHP Bob Terlecki (70) . . . Sunday: RHP Ugueth Urbina (41), RHP Barry Jones (52) . . . Monday: C Barry Foote (63),\. Steve Carlton posted a 241-161 record while pitching for the Phillies. 57.3% of his wins came at Veterans Stadium (138-62). He also owns the best single-season record (17-3).